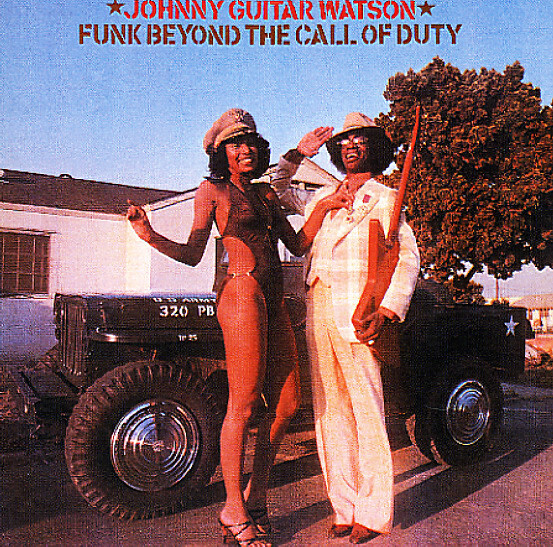 Welcome to the tournament, Johnny “Guitar” Watson. This is a really fun set, as evidenced by the presence of one of the kings of funk in the match-ups. Combine that with some mainstays and we’ve got ourselves a good set of songs. But first, the results of Day 3. On the left side of the bracket, we still anxiously await an upset- so far so good on our Top 16 songs. “Thunder Road” outlasts “My Cherie Amour,” 69.5-62.1. “Wanna Be Startin’ Something” shows “Folsom Prison Blues” the door, 69.6-66.6. The right side of the bracket wasn’t as straightforward. A pretty unimpressive come from behind win for Thievery Corporation’s “Radio Retaliation” which eliminates “Roadrunner” 44.8-43.4 but can’t break a 5.0 average in the process. And in the rap battle, Eazy E’s “Radio” eliminates LL Cool J’s “I Can’t Live Without My Radio.” 50.6-48.5. Alright, moving forward. Votes are due by Wednesday, February 27th at 8:00 PM EST. So vote tonight or tomorrow night, West Coasters. Playlist is here, full rules and philosophy here, and the tournament bracket is here. . See you in the comments! This entry was posted in Music, Music Tournament and tagged Beach Boys, Beastie Boys, Best Opening Track, Creedence Clearwater Revival, Dar Williams, David Bowie, Elvis Costello, Johnny Watson, Living the Dream, Regina Spektor. Bookmark the permalink. Not much of a contest this morning. Gosh I’ve come a long way since I gave “Wouldn’t It Be Nice” that 0 after that girl blew me off on that dinner date 2 years ago. No upsets here. Although Modern Love just might be a little much for this early in the morning. Aw, shucks, well ain’t Wouldn’t It Be Nice all sunshine and happy thoughts? I forgot. I don’t feel Down On The Corner. I feel the big DB. Regina Spektor’s ‘Begin To Hope’ album is one of my favourites. I think this song sums up everything that she’s so great at; I love it. Hadn’t knowingly heard AYOT before. Quite liked it at first but eventually found some of the lyrics quite annoying. Whoah. BILWTR is….a lot. I feel all funky and stuff. Oh the Beach Boys…Just love how they harmonize. Beastie Boys sure brought some nostalgia. There hasn’t been a time where I’ve ever heard Down on the Corner where my mood wasn’t improved…even on the best day. Modern love, I enjoyed you more than I expected to today. References to November Rain and Jimmy Olsen…great match up. 9- “Wouldn’t It Be Nice” (Beach Boys, Pet Sounds) vs.
I’ll let others decide. I love both of these too much. 6.5- “Down On The Corner” (Creedence Clearwater Revival, Willy and the Poor Boys) vs.
CCR is happy, but Modern Love is amazing. 8.5- “On The Radio” (Regina Spektor) vs.
I’m with Mark B. Love On the Radio, Love Regina Spektor. 9- “Radio, Radio” (Elvis Costello) vs.
Elvis has rocked the building. Though my heart really belongs to the Beastie Boys, Wouldn’t It Be Nice is an awesome track 1 to an even more amazing album. I agree with the previous statement that Down on the Corner is one of those few songs that can pick me up from any bad mood and make me wanna bop. Modern Love just doesn’t have that same affect. I have a severe dislike for Regina Spektor, not because I don’t think her music is worthwhile, but because she clearly has a relationship with whoever designed the Pandora algorithm and it’s inevitable that any station will eventually lead to her, if you listen long enough. So bizarre. And the Dar Williams song was terrible, sorry. Love Elvis + great funk numba’ = really close race. But ultimately feel that Radio, Radio is one of Elvis’ best. The Beasties speak to me. The Cool White Duke shouldn’t lose, but rednecks from California who are loremasters of the bayou win.